Portia White was a Canadian contralto singer who overcame the obstacles of gender, race and the exclusive nature of the classical music world to gain international renown, and recognition as one of the greatest voices in Canadian history. Portia May White was born June 24, 1911 in Truro, Nova Scotia to Reverend William and Izie Dora White. William White, the son of former slaves in Virginia, had moved to Nova Scotia to attend Acadia University where he was the first black Canadian to receive a Doctorate of Divinity. He became pastor of Cornwallis Street Baptist Church in Halifax. Izie Dora, born in Mill Village, Nova Scotia, was the music director, and the couple’s children sang in the choir. Portia was the third of thirteen brothers and sisters, two of whom did not survive childhood. As a girl Portia sang an aria from the opera Lucia di Lammermoor in a competition, and won first prize. In 1929 she attended Dalhousie University and became a schoolteacher in Africville, a Black community in Halifax. Determined to follow her dream of singing, she earned a scholarship to the Halifax Conservatory of Music, and won the silver cup in the Nova Scotia Music Festival in 1935, 1937 and 1938. She was bestowed a scholarship by the Halifax Ladies Musical Club, which allowed her to study at the Halifax Conservatory of Music. In 1941, at 30 years of age, Portia made her singing debut in Toronto. One reviewer said she had “a natural voice, a gift from heaven” (Toronto Evening Telegram) Well received by audiences and critics, she performed in nearly every major Canadian city. In 1944 she made her international debut in New York City, and the Nova Scotia Talent Trust was founded to help support her career. A three-month tour of Central and South America followed in 1946, and she sang in France and Switzerland in 1948. 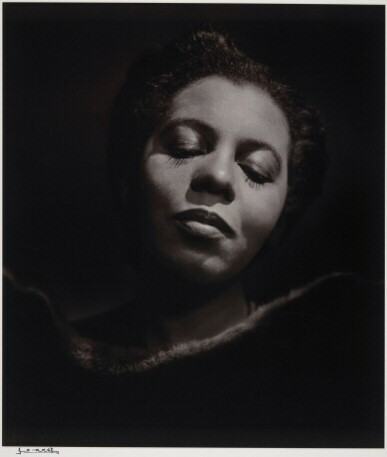 Portia White was the first Black Canadian classical singer to gain international recognition, an accomplishment all the more impressive when you consider how limited the opportunities were for artists of colour at the time. Her career was, unfortunately, short. Portia retired from public singing in 1952 due to vocal difficulties. She moved to Toronto, where she taught students including Dinah Christie, Robert Goulet and Lorne Greene. She did make a few appearances, the highlight being a command performance for Queen Elizabeth II in 1964 at the opening of the Confederation Centre of the Arts in Charlottetown, PEI. Honours given to Portia White include a monument in Truro, the Portia White Prize – the largest arts award of its type in Nova Scotia, and a documentary film, “Think on Me.” The Government of Canada named her “a person of national historic significance” in 1995. Canada Post featured Portia on a postage stamp in 1999, as part of a Millennium series of stamps celebrating Canadian achievement. The Nova Scotia Talent Trust that was founded to help her at the peak of her career is still supporting artists in the province, and established the annual Portia White Gala Concert in 2002. Such a wonderful SUCCESS story !! !….